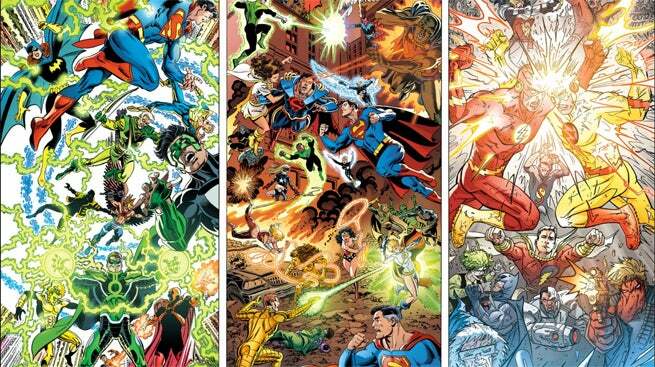 Since the mid-eighties, things at DC Comics have gone back to the beginning no less than four times. The continuity reset button was used to destroy the multiverse, to reset some timelines, and to restart the multiverse all over again. Now, thanks to Justice League #40 from Geoff Johns and a host of artists including Kevin Maguire, Phil Jimenez, Dan Jurgens, Jerry Ordway, Scott Kolins, Jason Fabok, Jim Lee and Scott Williams (phew! Plus colorists Brad Anderson and Alex Sinclair for good measure! ), all of those things happened, and not just in fans’ memories or longboxes. DC Comics has created a meta-continuity, a canon that encompasses every story in every universe that DC Comics has ever had, and not just for a silly event. Indeed, the writing was on the wall, at least a bit, when it came to Convergence, the April-May event going on now, which brings together universes and timelines previously thought lost. Now, thanks to Metron, the not-quite-a-new-god, we find out that all those old continuities are part of one big story, one that he has sat outside of in his Mobius Chair and watched unfurl. 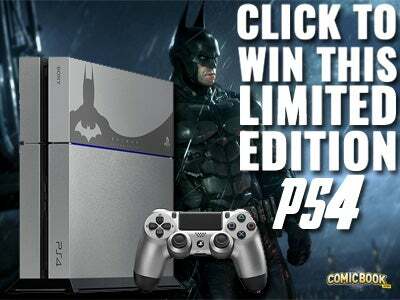 It’s something both of the big two have played with before. In fact, when DC moved from the Flashpoint universe to the New 52, there were some stragglers: Bruce suddenly had a letter from his father from that alternate timeline, and Pandora, who created the new universe, appeared in the first issues of all 52 comics released at launch. 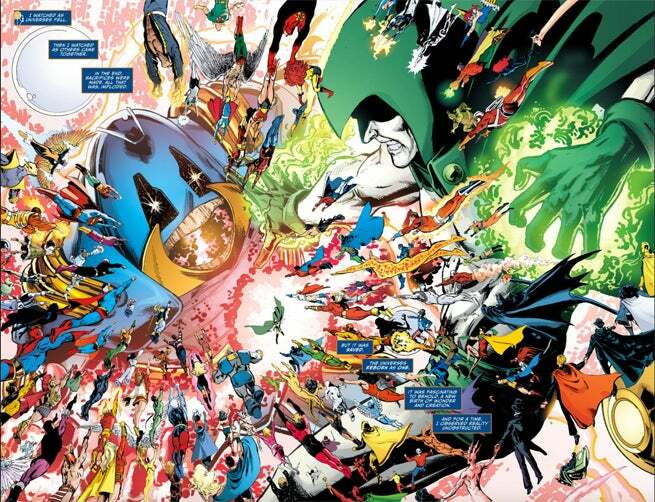 So, from the perspective of Metron, and as we learn a little later, likely the perspective of Anti-Monitor and possibly some of the other New Gods (including those on Apokolips), the Pre-Crisis universe happened, Crisis on Infinite Earths happened, Zero Hour happened, Infinite Crisis happened, Flashpoint happened, and it’s all been one universe (or multiverse), breathing in and out, exploding, imploding, and renewing. There is finally a character whose observance is the same as the readers; and if the New Gods have observed all these reality restructures, it puts a very different spin on them, as well. What’s more, Metron tells us, the latest version of the DCU has “yet to solidify.” Indeed, the incursions from Earth-3 and Earth-2 are causing considerable problems for the newest DC Multiverse, and it all comes back to Anti-Monitor, or his real name … Mobius. Yes, this is who Metron got his famous world-hopping flying chair from, and he uses it to protect himself from Mobius when he confronts the universe-destroying monster. These two are so outside of all these timelines and reboots, they even observe Brainiac’s Convergence, going on now. As the two of them discussed whether or not Mobius should/would destroy reality once more, Metron warned of war with Darkseid. Mobius said that’s exactly what he wants, in order to end the age of the New God and begin the age of the Anti-God, and he has a daughter of Darkseid to help him. So what does all this mean? Well, it’s not the first time, as we said earlier, that Geoff Johns has at least teased that all of DC history can be viewed as having happened. The cycle of death and rebirth is one seen all across comics, often literally with characters, figuratively with series and teams and alliances, and even with entire universes. It’s actually refreshing to see DC Comics say, “It’s all one giant story;” it just seems like they could’ve done that from the start of the New 52. The line that the newest incarnation has “yet to solidify” is very interesting, as well, since amongst some fans, there are still vocal contingents that aren’t happy with the changes. From here, we don’t know exactly where it’s all going. 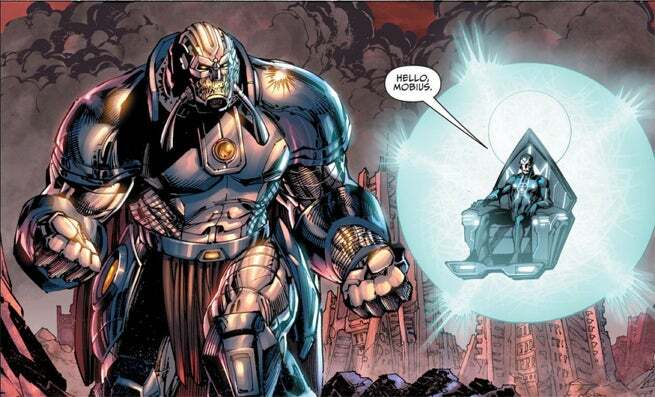 We know definitively now, that the Darkseid War coming up in Justice League is between Darkseid and Mobius, the Anti-Monitor. We know that Convergence is happening to all these timelines and worlds – it will affect them, and isn’t just a fill-in story while the company moves offices (though it certainly fit that bill as well). And we know that Mister Miracle, also featured in this issue, will be a central character in what comes next, thanks to this episode of DC All-Access featuring Johns and Fabok. So dig out all your old longboxes that you hid in the basement or the garage: they matter again. It's the DC Comics meta-canon, and it all happened.